Twenty-eight-year-old James Rankin died this date, March 8th, in 1850 and was buried at Bethel Burying Ground. Twenty-eight-year-old James Rankin died this date, March 8th, in 1850 of Tuberculosis and was buried at Bethel Burying Ground. According to the 1847 Philadelphia African American Census, he was married (spouse unnamed) and they had a daughter under five years old. Mr. Rankin was employed as a waiter and his spouse as a laundress. Their one-room (11’x 11′) home was located in the rear of 137 Lombard Street which is in the 500 block of Lombard Street, only yards away from Bethel AME Church. The Rankins were among the working poor in the Black community paying $2 a month for rent and only owning a total of $10 in personal property, according to the 1847 Census. Living in the front of 137 Lombard Street was the Rev. Stephen H. Gloucester and his family of twelve. He was the pastor of Central Presbyterian Church which was located a block away in the 600 block of Lombard Street. Reverend Gloucester established a school for Black children and organized a library for Black adults. He was active in the Philadephia Underground Railroad and organized several anti-slavery societies. In 1938, he became the publisher of the Colored American newspaper. The publication advocated for abolition, educational improvements, and civil rights while rallying against prejudice and oppression. James Rankin and Rev. Gloucester were neighbors and likely saw each other daily and especially on Sundays at the Lombard Street Central Presbyterian Church (above) erected in 1848. The Rankin family probably walked past the church in the comings and goings of their everyday life. The white obelisk in front of the church was not installed at the time. It is the grave marker for Rev. Gloucester who died of Pneumonia only two months after Mr. Rankin’s death. Ms. Gloucester is also buried in the same vault. I was unable to locate any information on Ms. Rankin and her daughter after James’ death. *For more information on the life of Rev. Stephen H. Gloucester please go to http://planphilly.com/articles/2008/11/22/4551. 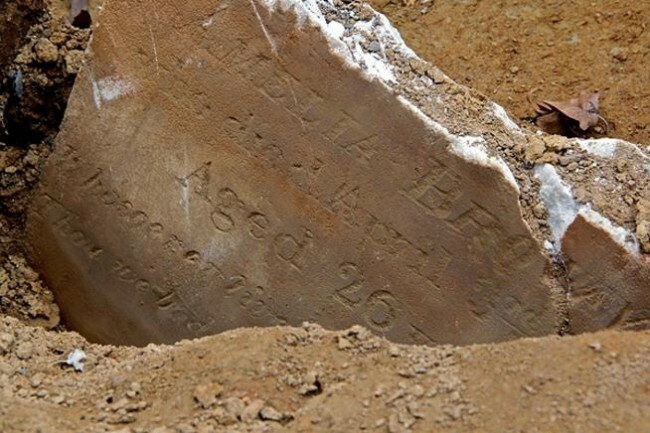 ← Twenty-six-year-old Susan Burton died this date, February 28th, in 1811 and was buried at Bethel Burying Ground.